Peel the apples and cut into 1-centimetre cubes. Make a light caramel with the sugar. Add the apple and stir gently to cover each cube with caramel. Grate the vanilla pod and add to the mixture. Deglaze with the maple syrup (optional). Leave to cook on a low heat until the liquid has evaporated. The apple cubes should keep their shape and not turn into purée providing the caramel is light and golden. Chop the chestnuts in a blender. Mix the ingredients gently with a spatula. Spread out on a sheet of baking parchment. Bake in the oven until the crumble turns golden. Allow to cool and crumble coarsely. Melt the dark chocolate in a bain-marie or a microwave oven. Spread the melted chocolate on a cling film sheet, cover with a second sheet and spread out with a rolling pin. The layer of chocolate should be thin and even. Allow to cool. Cut 8 discs using a circular pastry cutter of about 4 cm diameter. Cut 2 discs of a larger diameter, depending on the size of the plates on which the dessert is to be served. If desired, embellish with the help of smaller pastry cutters. Cut these large discs in 2. Make a caramel with the sugar. Heat the cream and add to the mixture with the semi-salted butter. Take a first disc of chocolate and, with the help of a pastry cutter with a diameter of 5 cm, top with a layer of caramelised apple. Add a second disc of chocolate on top, and then a second layer of caramelised apple. Place a large semi-disc of chocolate on each plate. 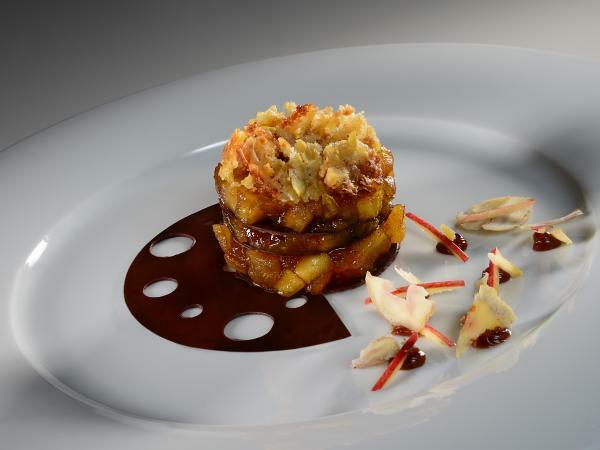 Arrange the caramelised apple mille-feuille in the middle of the plate. Decorate with circles of chocolate sauce; top these with small sticks of raw apple and pieces of cooked chestnut.